This morning, when I was on the bus, I never intended on having McDonald's, and I was actually planning on writing a review from a burger I had in South Africa later in the evening, but the "sponsored ad" on Facebook was from McDonald's promoting the new McAloo Tikki burger in Singapore! Yesterday they had a promotion if you downloaded the NETS Saver app, it gave you a coupon for a free McChicken. I actually took advantage of that promo at Changi Airport as my wife was flying to London, and unlike the last time they gave away a free McMuffin, there weren't hour long queues, so we split the free McChicken as a nice pre-departure snack. Honestly, I would have liked it if they gave a promo for one of these new $2 McAloo Tikki burgers, as they are the same price as a McChicken, and maybe it would have got a couple more people to take advantage of the promo. This was also the first time I've utilised the McDelivery service here in Singapore. I've always been shocked, with Singapore being as small as it is, that there isn't much delivery culture here (as opposed to Korea, where you can get EVERYTHING delivered, and sometimes, unbelievably fast), even the postal system is noticeably slower than other countries. I've tracked parcels arriving in Singapore, and though it might be quick to arrive to Singapore, it always hits a wall as soon as it enters the Singaporean postal system. 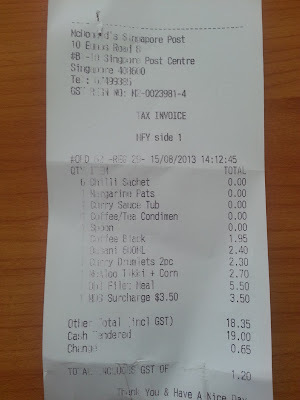 What was even worse, was not only does the McDelivery charge higher "sticker" prices than in a store, but then it also adds 7% GST at the end of the purchase (whereas posted prices here usually include the GST already), and then tacks on another $3.50 in a delivery charge. Personally, I would have never used the McDelivery service at those prices, but it was a treat from a colleague of mine. At least it arrived on time. I was actually quite surprised about the introduction of the McAloo Tikki, as McDonald's in South East Asia doesn't usually introduce many vegetarian options, let alone a vegetarian promotional item. It's release coincided with the end of the Rendang burger. I guess how the Rendang Burger was to cater to the Indonesia/Malay population of Singapore, the McAloo Tikki burger is solely directed to towards the Indian population. It's actually been available in Indian McDonald's for a couple of years now. I didn't try it when I visited India in 2006, so today was a first for me. 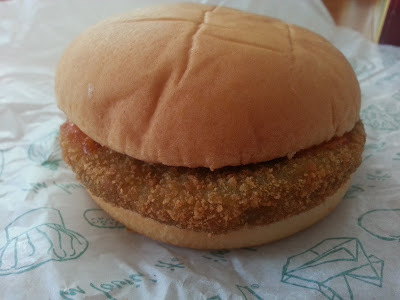 As the promo copy states, it is a potato+pea breaded patty. 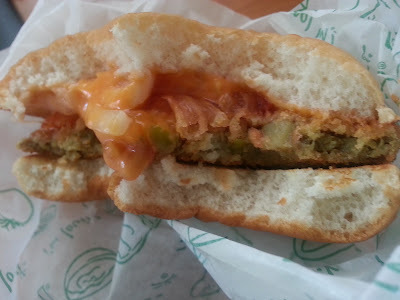 As you can see in the photo below, I think they went a little overboard with the breadcrumbs, but it still allowed me to taste the spices within the patty. 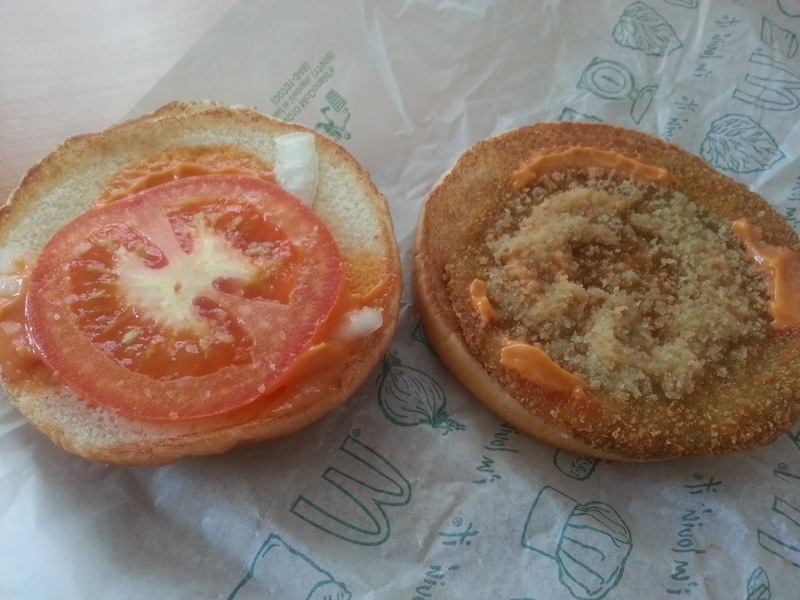 The tomato mayonnaise was different, but definitely not my favourite. Since there was a nice big slice of tomato already, I thought the tomato-mayo made the sandwich taste a little too tomato...y. Don't let me scare you off though, though the sauce wasn't my favourite, this was still one of the better tasting promo burgers I've had in Singapore recently. I quite enjoyed it, and since I ordered it with a side of corn and a coffee, it made a very nice light lunch. At $4.50, and since I'm only eating for 1 for the next little while, I'll definitely be getting it again. 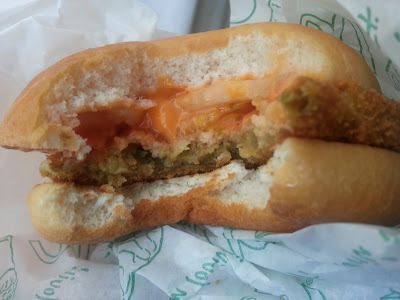 Though you might think this is a simple Veggie burger which is available in some other countries, you'll be wrong, as you could definitely taste the Indian spices inside. For those of you which aren't favourable to Indian spices, this wasn't tongue burning 'spicy' but flavourful spicy. This is McDonald's so it wasn't as nearly spicy the same patty you'd get in India, but it was still pretty tasty. They are selling it on it's own for $2, and in a combo for $4.50, the same as the McChicken, it's pretty much exactly the same size as a McChicken, though with the inclusion of cheese, tomato, even with the not-so great sauce, I felt that this is even better than a McChicken. As I said before, I will be getting it again, and I'm sure if it's still available when my wife returns to Singapore in 3 weeks, that she'll enjoy it as well. One thing which was a little strange, was though McDonald's just finished Curry Shakers along side the Rendang Burger. It seems strange that they launched a Indian flavoured shakers with the Rendang, but for this actual Indian burger, they brought back the Thai Citrus Shakers from earlier this year, I didn't bother upsizing the combo to get them again, but they must have had them left over since then. Is this the reason why McDonald's introduced the veggie burger in Singapore? 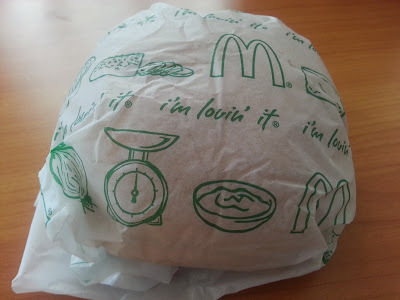 Mc Donald's Indian burgers are the worst. I used to like McDs before but now (for the past 4 or 5 years) they have started putting this sauce which tastes like a masala with a little spice and its the worst. Ordinary Burgers from smaller chains tastes much better than most of McDs Indian burgers. All they need to do is remove that sause and put a little ordinary mayonnaise or cheese and the burgers will be infinitely better.